Bumps and starts. – Dirty wet dog , boats and sailing. After my night passage i had 3 days of fairly intensive sailing trials mainly concerned with the changes and modifications i have made over the winter : with previous boats i have tended to take the approach of modifying just one thing and seeing how the changes work out but with this project i have done a whole load of things that i need to test before i leave on the first stage of the voyage. I could potentially be leaving as early as next week although there is a spanner, actually 2 spanners and half a socket-wrench set thrown into the works right now but the time pressure is really on. I could have just had 3 days fairly lightweight sailing and relaxing as its been a fraught time at work but i chose instead to give me and the boat both a bit of a workout : i did the equivalent of what a driving instructor does at a certain stage with a learner ie a rapid fire sequence of drills and manouevres rather than just going for an easy drive. 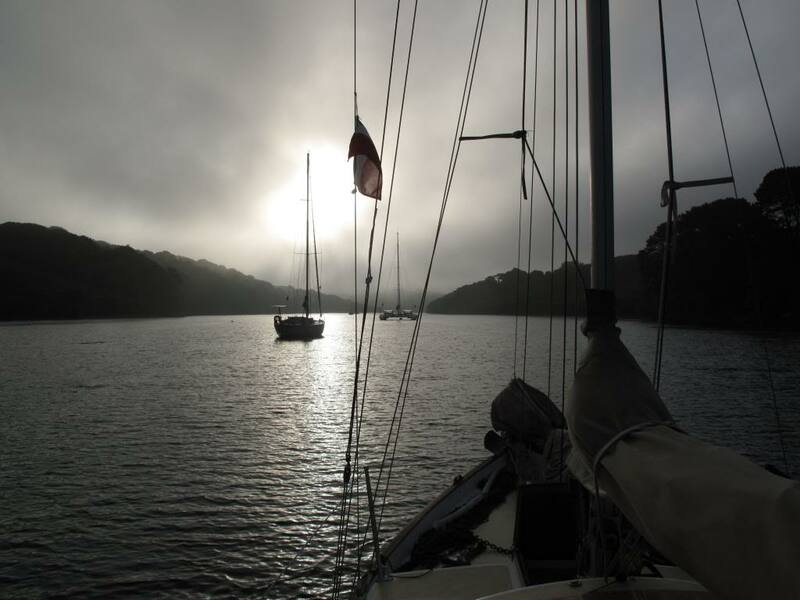 For me that meant moving on nearly every tide in close to a 6 hour work cycle both night and day, that meant that i would have to quickly prepare the boat to sail, motor or paddle, move off and work on some aspect of the sailing and then anchor in a different spot and make some changes. I did also make sure that i had some time off but after a full day of cleaning and re-stowing i am pretty tired but a lot happier with the boat. It wasn’t all work, on the first morning for instance when i had woken up in the dark and put a small amount of water back where it belongs i was able to kick back with a coffee and breakfast in my bunk while looking aft out of the hatch…..with the boat swinging to the end of the old tide i got a slow and steady pan across a changing scenery of marsh, reeds, river and woodland with a few owls for audible company. It almost felt like waking up under my basha out in the woods and just contemplating getting the fire going for a cooked breakfast. Generally it was a grey and dull few days with mainly light winds : running back up the river this morning almost ghosting and with barely steerage it was notable how soft and muted everything looks with hardly any green on the trees yet…i guess its still very early in the year though. What i did i work on then and what worked and didn’t ?, well i anchored and up-anchored many times sometimes 3 or 4 times a day and messed around with 3 different anchor set-ups to work out which one will be my primary and secondary syetems : bower anchor and ‘instant’ kedge/lunch hook. I sailed quite a lot in short bursts working on finding out how the weight/balance changes have affected the sailing performance and feel, sadly i didn’t have much wind to play with and only got fully powered up a couple of times and didn’t need to reef seriously so that part most likely needs more work. Along the way i also did a whole load of small finishing and jobs and re-organising the stowage. As an example i spent more time trying to cook properly in the new galley and had a go at baking in my improvised dutch oven. At the end of 3 days i think i have de-junked the boat and for once have most things where i can find them, the boat is at least semi-clean inside and out…got a bit green outside and dusty inside with all the jobs. I did of course generate a new jobs list and shopping list but apart from fitting a tillerpilot won’t be taking on any new major jobs now. In a couple of days it will be time to shop for fresh food, put the spare petrol cans and meths on board (the water cans are filled) and decide which way to go. By golly you’ve been busy…good luck for your impending adventure, which ever way you turn! Exciting times Steve. Looking forward to following you’re journey.